Running over the Christmas and New Year holiday period, Merry Mayhem is one of the most exciting and popular events in all of Entropia Universe. Entrants may participate in one of ten Solo Mayhem categories, as well as Free-for-All Mayhem. There’s also an extra hunting mission for newcomers alongside the main event! All creatures in the Merry Mayhem Solo and FFA instances have the potential to loot Christmas Strongboxes, Mayhem Tokens and new Mayhem-exclusive items. ◾ Dec. 15, 14:00:00 UTC - Merry Mayhem 2017 begins. ◾ Jan. 15, 14:00:00 UTC - Merry Mayhem 2017 ends. ◾ Jan. 22, 14:00:00 UTC - Cutoff for submission of FFA Mayhem Stars for the Free-for-All Mayhem category. ◾ Feb. 5 - Event results announced. Prizes awarded in the following days. 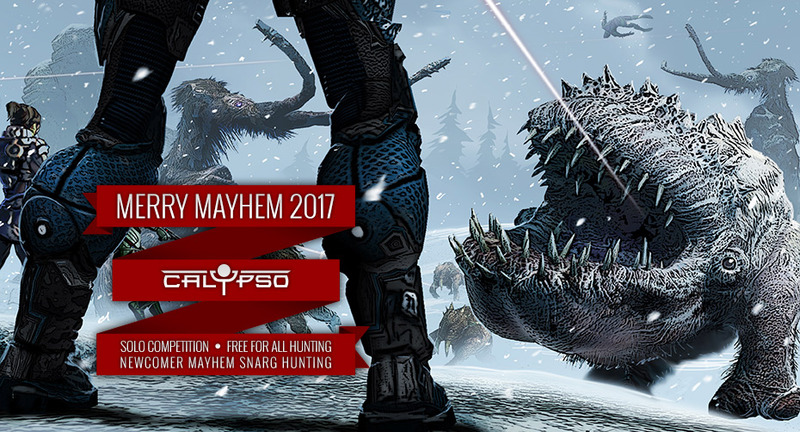 The Merry Mayhem event offers two competition divisions: Solo Mayhem and Free-for-All (FFA) Mayhem. Solo Mayhem is the place for individual hunters to shine. The Solo Mayhem event features ten separate categories, each with its own prize pools. Solo Mayhem instances are accessed from the Event List interface from anywhere in Entropia Universe. ◾ Each Solo Mayhem category instance restricts entry based on the maximum (unbuffed) health of avatars (see detailed category info below). ◾ Each Solo Mayhem category instance restricts entry based on the damage-per-second of equipped items and prevents equipping items inside the instance using the same restriction (see detailed category info below). This restriction is based on the base damage-per-second of an item, and does not include any amps, buffs or enhancers. Base DPS for a weapon can be viewed in the Item Info panel, under the Basic Information tab. ◾ The Solo Mayhem instances can be run as many times as desired during the event period. An average Solo Mayhem run should take 20-30 minutes. Occupied instances will remain active for up to 3 hours for normal hunting. Creatures will stop spawning once the instance boss is killed. Instances are reset upon exit or client closure. ◾ Occasionally areas within the Solo Mayhem instances can be affected by earthquakes which slow movement speed by up to 80%. ◾ Each kill of the Merry Hogglo boss is rewarded with a Christmas Strongbox. ◾ There are three daily missions available, one for each of the Solo Mayhem creatures, which award Mayhem Tokens. These missions are automatically triggered up entering any of the Solo Mayhem instances. Performance in Solo Merry Mayhem is time-based. The objective is to kill a special immobile Merry Hogglo boss creature as quickly as possible. The Merry Hogglo boss is immune to damage unless a special buff is active. This buff is received after killing an elite Merry Hispidus, and allows the Merry Hogglo to be damaged for 60 seconds or up to 20% of its maximum health. A Merry Hispidus is spawned after killing 20 Merry Daikiba creatures, with a limit of 3 Merry Hispidus active at any one time. Upon killing the Merry Hogglo boss, the instance stops spawning new creatures and the participant’s time is recorded for the current category if that time is shorter than any previous runs in that category. Participants may only have an active placement in one category at a time. Recording a new placement (by killing the Merry Hogglo boss in the currently active instance) will remove any placements recorded in the current category, if the latest run is faster (would result in a higher placement). If a participant has an existing placement in a different category than the current instance, the existing placement will be replaced if the placement in the current instance category would be a higher rank than the existing placement. The Free-for-All category allows hunters (either solo or in teams) to compete for prizes in an unrestricted, no-holds-barred single-category format. FFA Mayhem Stars are tradable, allowing participants to either sell their tokens to the highest bidder, or turned in to increase their own event scores. The Santa's Little Helper NPCs in Nymphtown, Fort Zeus and Fort Ithaca provide access to five different FFA Mayhem instances, with creatures of various levels. Prizes in Merry Mayhem are awarded in the form of Mayhem Tokens, which can also be looted from event creatures in this and all future Mayhem-style events. Mayhem Tokens can be exchanged for exclusive items via the Mayhem Token Trader, located in Cape Corinth, Port Atlantis and Twin Peaks. Mayhem Tokens are non-tradeable, but the items available for purchase in the Mayhem Token Vendor are tradable. Note that certain Mayhem Token Vendor items may also require special Placement Mayhem Tokens (PMTokens), awarded as event prizes, in order to be purchased. Bypassing or attempting to bypass any of the Solo Mayhem instance entry or item restrictions will be grounds for disqualification from the event, forfeiture of any prizes, and possible sanctions imposed on one’s Entropia Universe account.